On the margins of the meeting at the Belt and Road Forum International Summit in Beijing, President Joko ‘Jokowi’ Widodo held a bilateral meeting with Chinese President Xi Jinping, at the Great Hall of the People Building, Beijing, Sunday (14/5) afternoon. On that occasion, President Jokowi reiterated his desire to seize the Belt and Road Forum International Summit to create fresh momentum, especially for China – Indonesia cooperation under the One Belt One Road (OBOR). “I believe that the Belt and Road initiatives will further strengthen economic relations between the two countries, especially as Indonesia focuses on infrastructure development, connectivity and maritime fulcrum,” the President said. In this regard, President Jokowi specifically invited the Chinese Government to work with the Indonesian Government in three megaprojects. The three mega projects offered are corridor projects of integrated economic, connectivity, industry, and tourism in North Sumatra such as Kuala Tanjung Port facilities and road access from Medan to Sibolga; investment opportunities in North Sulawesi that will improve infrastructures in Bitung-Manado-Gorontalo through access roads, railways and seaports and airports; and investment in energy and power plant projects in North Kalimantan. President Jokowi and President Xi Jinping witnessed the signing of a working document, that is, the implementation of the 2017-2021 Indonesia-China comprehensive strategic partnership. 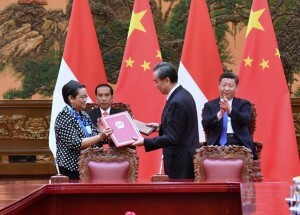 The signing was conducted by Indonesian Foreign Minister Retno Marsudi and Chinese Foreign Minister Wang Yi. In addition, the signing of the second cooperation document of China Economic and Technical Cooperation was conducted by the Minister of National Development Planning/ Head of National Development Planning Board (Bappenas) Bambang Brodjonegoro and the Minister of Commerce of China Zhong Shan. The third cooperation is the facilitation of the Jakarta-Bandung high-speed rail project signed by President Director of Indonesia-China High-Speed Train Company PT. KCIC Hanggoro and President Director of China National Development Bank Hu Huaibang with a commitment value of cooperation worth US$4.498 billion. Also accompanying President Joko Widodo in the meeting were Coordinating Minister for Maritime Affairs Luhut Binsar Pandjaitan, Foreign Minister Retno Marsudi, Minister of State Secretary Pratikno, Minister of State-Owned Enterprises Rini Soemarno, Minister of Transportation Budi Karya Sumadi, Minister of National Development Planning/ Head of National Development Planning Board (Bappenas) Bambang Brodjonegoro, Head of Indonesian Investment Coordinating Board (BKPM) Thomas Lembong And the Indonesian Ambassador to China Soegeng Rahardjo. (DNS/ES) (MUR/YM/Naster).